Once I started, it was hard to stop. In fact, I have held this post so as not to bore you, dear reader. 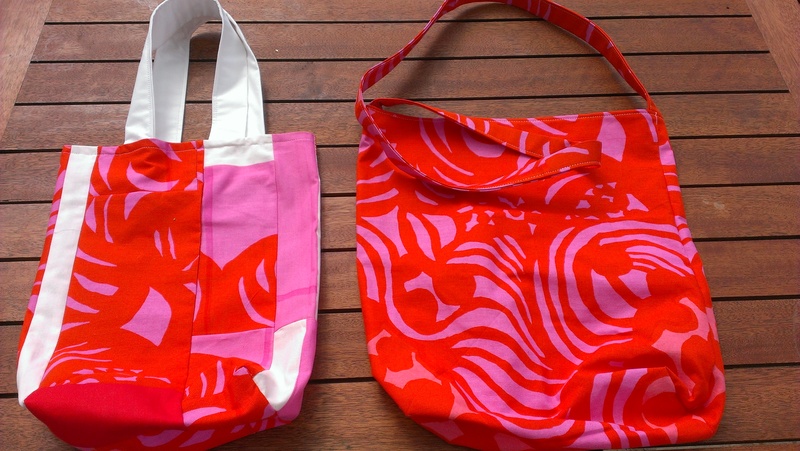 I have so many higher priorities, but somehow bags are simple and satisfying and so is using up all those scraps… I found this Marimekko print in an op shop one day going for a song. I knew it would come in handy and one day I realised that I had a friend whose favourite colours seemed to be orange and pink… and whose beloved mother had cherished Marimekko. I am guessing she would have especially loved the Marimekko prints of this period. So I made my friend a shirt. There was guesswork involved for it to be surprise, but it worked out really well. And this is the very last of that fabric! And here are a pile of the blue and purple scraps. Parts of recycled garments. Leftovers from sewing new garments. The hem of some pants I must have taken up for someone. Pieces leftover from a quilt made years ago. Oddments of lovely prints. Strips of sheeting or quilt covering bought as offcuts. Out of the stash and out to new homes at last! Leftovers from a quilt. Op shop offcuts. Parts of a skirt. Inherited fabrics and sheet offcuts. 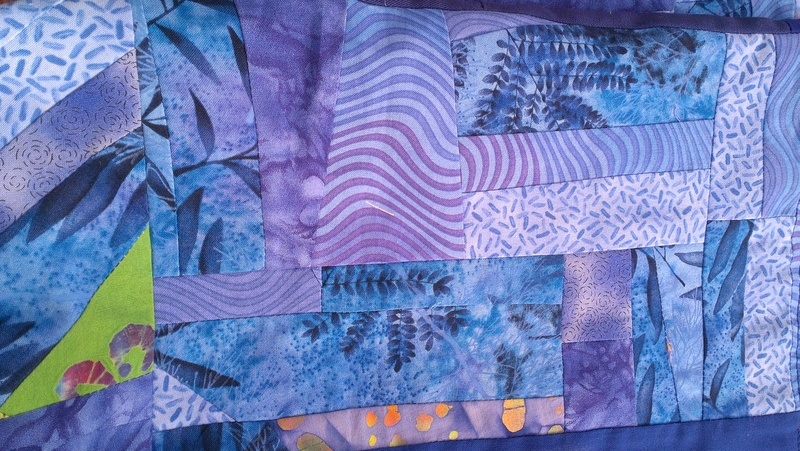 Then I found a piece of patchwork created from many small pieces cut to create quilt blocks. Clearly I couldn’t bear to waste them and made crazy patchwork . 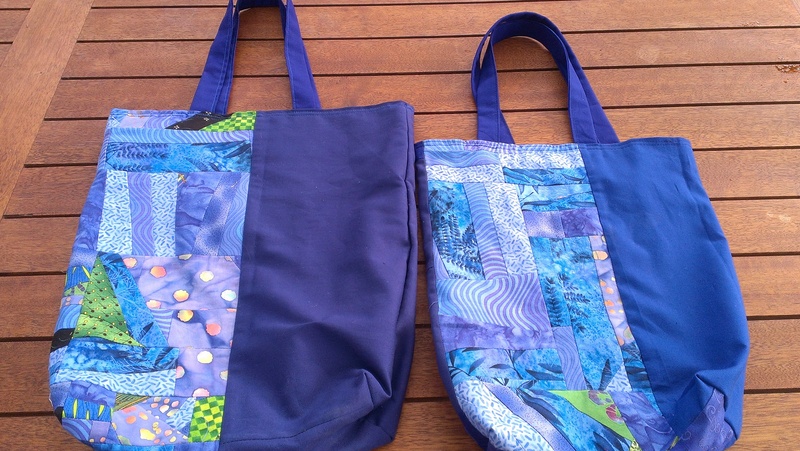 I had to fully line these bags to manage all the seams on the inside. Batik scraps. The better part of these sarongs was turned into two shirts and a pair of pants. 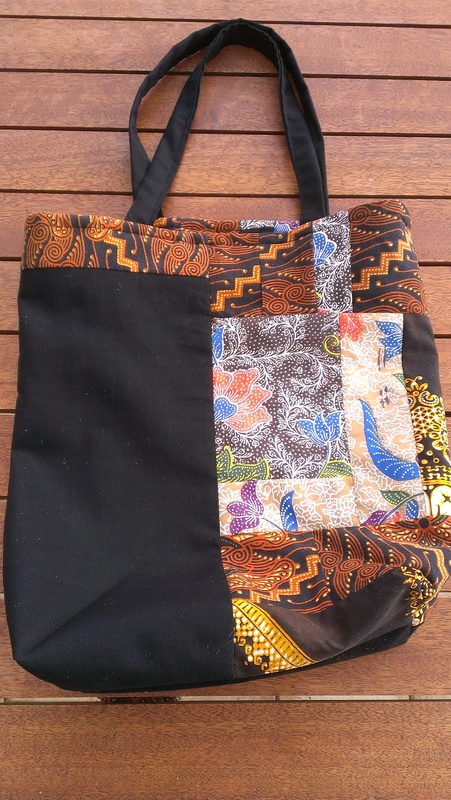 And another bag…! 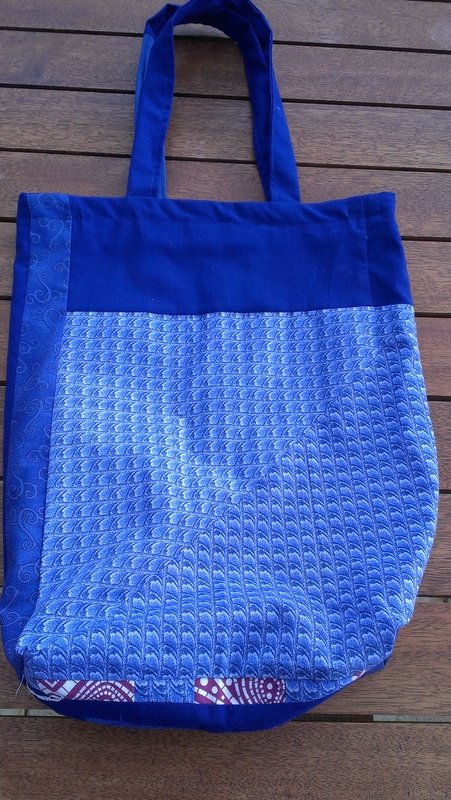 And finally, all that remains of a blue print from so many other bag projects, and at last… a bag using the print that started this bag jag. 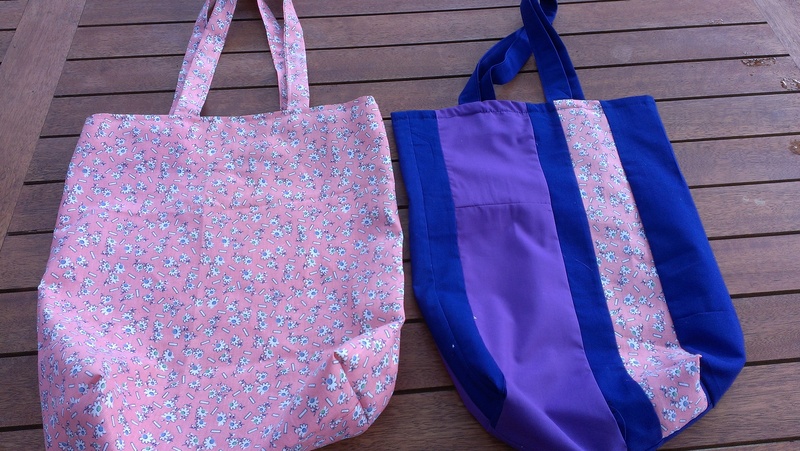 It’s the top half of that bag on the right, and a fine strip in the middle as well. One came wrapped around a birthday present and the other was tied around it as a ribbon. Perfect. Finally, I put all the fabrics back in the cupboard and vacuumed the floor (cutting out so many pieces had made rather a shower of threads and fluff), And hoped that might back of the bag thing for a while. Or until next time. Puts a whole new meaning on the term ‘bag lady’ …. What a lovely take on the bag drama, Manja 🙂 I really enjoyed the idea of the bags being clever enough to reorder my priorities! Bag Lady, haha love it. Nice batik material, the Merrimekko print is a doosy! I have a lot of bags and most times they are NOT the size I need! I am sure it DOES mean you need to make more! Another bag lady! I lived in the false belief I’m the only one… 😉 And I love Marimekko too! 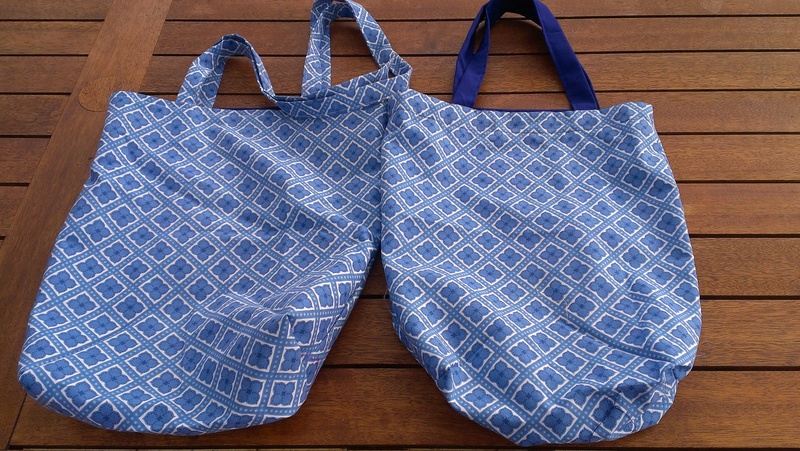 But a question: have you found the ultimate bag: the one that can be used as a hand bag, shopping bag, hiking bag, spinning and knitting bag, camera bag, and that isn’t big but rather smallish, and that you can either carry in your hand or on your back? Because, I haven’t. Yet. But I still have hope. 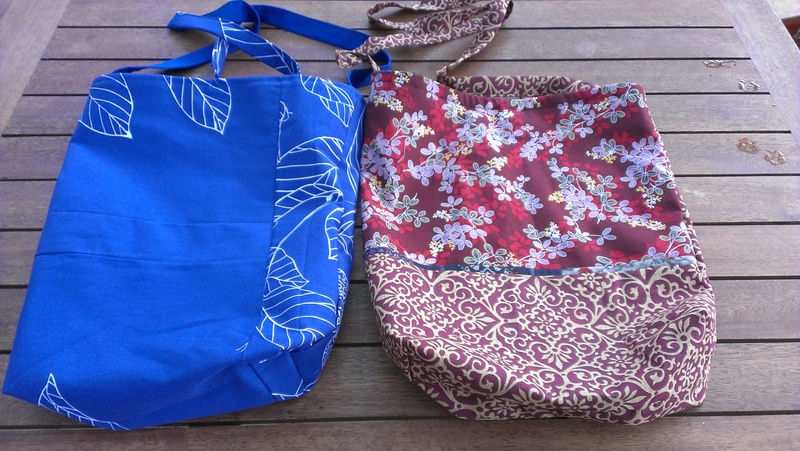 so impressed with the lovely bags and the tremendous output! A pair of potholders I found at a thrift (op) is that same Marimekko pattern. The “heat” of the colors seems appropriate for potholders. I agree about the heat of the colour scheme–wonderful. 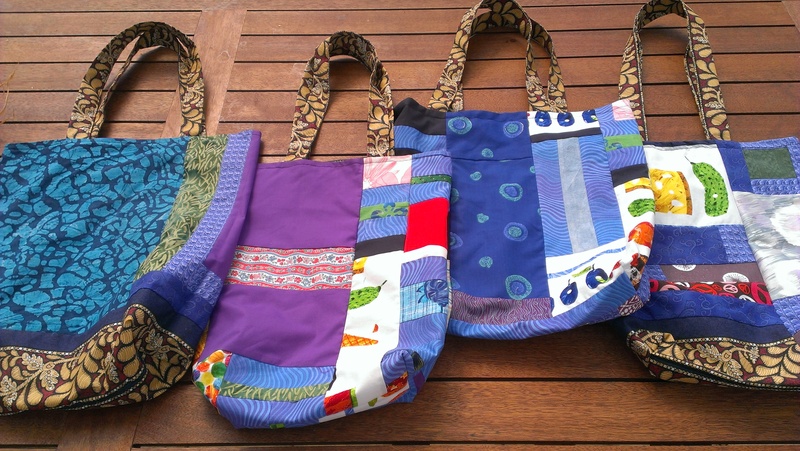 Yesterday I sent the remaining pile of bags off to an op shop benefiting Medecins Sans Frontiers with a friend. So they have gone to a good cause. That’s a wonderful use for them!